Thursday is data day, and I’m pointing you to some data from the Pew Research Center’s Project for Excellence in Journalism. 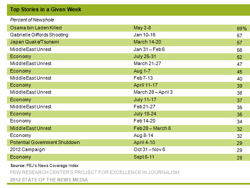 They have looked at the major stories of 2011, measuring the percentage of the newshole for its week of occurance. Their analysis identified five times when a single story filled at least half of the newshole. Number one was stories around the killing of Osama Bin Ladin by Navy Seals, filling 69%. Here is the data on the percent of the newshole filled by the top # stories. As these are about “stories,” it might be an excellent basis for student-produced infographics.